"[Science fiction] is the one literary medium left in which we have a free hand. We can do any damn thing we please." "...Aub!" There was something imperative about his manner of biting off that one syllable name, but then he was a great Programmer speaking to a mere Technician. "Aub! How much is nine times seven?" Aub hesitated a moment. His pale eyes glimmered with a feeble anxiety. "Sixty-three," he said. Congressman Brant lifted his eyebrows. "Is that right?" "Check it for yourself, Congressman." The congressman took out his pocket computer, nudged the milled edges twice, looked at its face as it lay there in the palm of his hand, and put it back. From The Feeling of Power, by Isaac Asimov. Thanks to Brad Templeton for the tip on this item, and Winchell Chung for pointing me at the right thread. See also this usage from their 1981 novel Oath of Fealty. Apparently, they also included some sort of wireless link, because (elsewhere in the novel) it says that, when the officers were off duty, they "could always be reached on their pocket computers." Another early mention of a small "pocket computer" or note-taking device with some mathematical functionality built-in is the calculator pad from Foundation by Isaac Asimov. Asimov also mentioned a "pocket-computer" in his 1975 story Point of View. 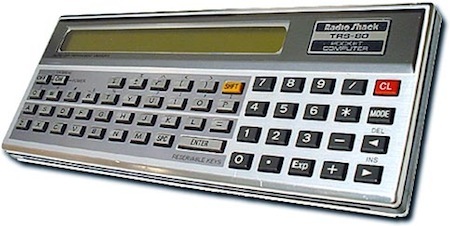 As far as I know, the first pocket computer sold as such was the TRS-80 PC-1 in 1980. It weighed 6.0 oz., had 1.5 kilobytes of RAM, was programmable in BASIC and cost $230. I should also mention the handbag computer from The Futurological Congress (1983) by Stanislaw Lem. Can An Entire Brain Be Simulated In A Computer?